I was in San Francisco last week for Dreamforce, the yearly confab for Salesforce that has had a major focus on social business the last couple of years. There’s little doubt that Marc Benioff clearly sees the very near future of business, and it’s something he calls the social enterprise. While you can read my blow-by-blow of the opening presentation, which was one of the most impressive cases for becoming a social enterprise yet made in my opinion, the process of social business transformation is a complex one and isn’t going to be made so explicitly by many firms. That’s not to say that some organizations, either by inclination or through gifted leadership (or both), won’t naturally adopt social business methods. To them, the patterns, tools, and modes of participation are even easier ways of working than what they do today and there are relatively few obstacles. Those aren’t the companies that will ultimately have a dark night of the soul as they look at what their competitors are starting to accomplish and wonder how they can get there too. As the evidence mounts that socially engaged workforces, along with their trading partners and customers, result in more productive, efficient, and profitable enterprises, it will be — by definition — the organizations less likely to be able to make the transition that will have the most challenges and the longest path. This was a key point made at Dreamforce, namely that there is a growing “social divide” between 1) our customers and workers, and 2) our organizations, the latter of which have been much slower to adopt social methods of engagement, both internally and to the world at large. Like Benioff, I’ve long predicted that the gap between how we’ve changed as a culture and society will become untenable with the relatively slow rate at which many of our businesses are adapting to these changes. Benioff has gone so far as to seriously suggest that there will be a “Corporate Spring”, analogous to what’s happened in the Middle East this year, that will change the status quo positively from companies to governments as aging and obsolete methods are cast aside by workers for better social ones. Frankly, this loss of control is evident in many organizations when they do any kind of application audit these days: Workers are using the means that pose the least barrier for them in getting their work done. Social media is increasingly winning the growth game with shadow (unsanctioned) social tools for collaboration, for example. These are technology and behavioral shifts that just about every CIO is closely tracking at the moment. But the transition to the social enterprise, as inevitable as some (including myself), think it will be, will not be as simple as buying the latest social software solution — no matter how good — and declaring victory. For starters, the process involves genuine cultural change even more than than it requires technology enablement. Then there is the sheer size and variability of the enterprise itself to contend with. The truth is that as compelling as comprehensive platform visions such as what Salesforce articulated last week are, the journey towards social enterprise involves conscious decisions to change organizational behavior, business strategy, and technology. Moving from some participant channels, then to all separately, and finally together. Right now most organizations are just developing their social engagement capabilities for B2C, B2B, E2E, and E2B. They will develop them separately for the most part, then learn the importance (and need) to cross-connect them strategically and then begin unifying the platforms, organization roles, resources, and processes so that there is consistency, reduced duplication, better governance, and higher business impact. The organizations that can do this in the fewest steps will be the winners and they will be aided by increasingly mature platforms from the largest vendors, though some companies will roll their own. Going social generally first, then connecting social activity to work processes. Those that have been following the extensive discussions recently in the social business community are becoming more aware of how important that social activities be integrated with high value work streams. If business applications for customer care, product development, operations, and so on are isolated from social tools, then by definition there will be limited impact. Most organizations will adopt general purpose social communities (internal and external both) and then begin the hard work of integrating them to line of business applications as well as producing new kinds of socially-enabled applications that didn’t exist before, such as social intranets, location-based apps, and much more. Lesson: Those that can put social to work with business apps via a more direct and meaningful route will generate substantially more business value than those that don’t. Starting at the departmental level and then creating enterprise-level social business capability. This is the story around the social business unit and CIO-level programs to provide the strong technical support. Unfortunately, cultural support for change will lag in many organizations that don’t have strong social business leaders at an executive level, as serious a hindrance as not having social business capabilities themselves. Top-down leadership and grassroots initiatives meet in the middle, then sort it out. Most organizations have blogs, wikis, social CMS and other social media lurking in the margins, some even that are quite successful. At the same time, many organization are indeed pushing out official efforts but ones that don’t necessarily have support and buy-in from workers. Very often, the issue is with different parts of the organization at approximately the same level will engage in internecine conflict until their approach, platform, or preeminence wins out. While this is what happens at first, slow in same cases, though more quickly for high functioning organizations, the issues get resolved and the various parts of the organization generally becomes “calibrated” in the same direction, resulting in a unified approach to social business in general. It’s clear that social business can be an arduous and difficult road for some, but it’s also a profoundly rewarding one as organizations consciously update their digital strategies for the 21st century to reflect the realities of and changes in the modern world today. The good news is that we now know more than ever before what the broad outlines of the transition to being a social enterprise will look like. I think you’ll find that aids like the list above helps see the context and the eventual end point to aim for. There are also many other valuable lessons learned accumulating in places like the Social Business Council and the Community Roundtable. Fore now, smart and forward-thinking organizations will begin looking more holistically at how they are evolving and develop strategies to make the transition with the least disruption, fewest steps, aimed at the most constructive and valuable outcomes. 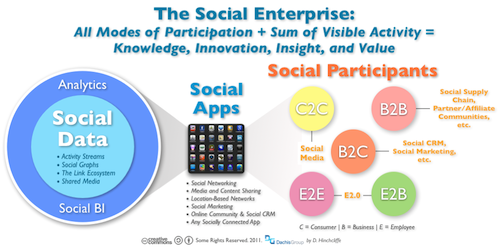 What else are you seeing in terms of convergence of social business activities in your organization?